Playing FF was a heck of a lot more enjoyable than I had anticipated, partly because I went all in, shamelessly importing four characters from the magical gamespace multiverse to flesh out the Warriors of Light. Through them, I could inject personality and commentary into a very simple game whose party was only as interesting as you imagined it to be. If I hadn't done that, the game would've been been flat like Zork, or like ... well, early Might & Magic, not that anyone here played that puppy. I came into Final Fantasy I thinking, "Well, this is the first Final Fantasy, so I mustn't expect the complexities and story plotting and characters of the later games. It'll be simple and clunky and the game mechanics will probably drive me INSAAANE." By virtue of the fact that I was playing a remastered edition, I didn't have to deal with the arbitrary game mechanics of the original, so I could just sit back and play it. I don't feel any burning desire to play games on PROUD or HARD or ARTIFICIALLY DIFFICULT mode. I've done graduate school three times; that's enough for me. I liked FFI. It really did have a certain charm, despite its stock fantasy simplicity; it did have many of the beloved game and story elements that have made Final Fantasy enduring. I could believe that this game hooked enough players to rescue Square from near-bankruptcy. Even odd little things like the iconic black mage with the Jawa eyes contributed to making it just...a little...different. Of course, all the D&D flashbacks gave me the nostalgia factor I was missing by not coming to Final Fantasy until VII-VIII. So that helped. So, some in-game stuff. Spoilers to the ending, such as it was. Above: My 30-year-old hand-painted D&D figures face off against my Final Fantasy figures for the last remaining die from my basic D&D set. ( heavenscalyx painted the woman in front center with the staff and hammer, my longtime fighter-cleric Moy Ruadh; to her left are a D&D Ranger (archer) whose name I've forgotten, a Magic User in blue named Gadrath the Unfortunate (Mom's main character), Dad's Haakon in full plate mail and shield at far left, and a bunch of fighters behind them including Gaon Birchlurcher the Elf in the blue cloak (my very first character), Raknar the Dwarf, my grog/retainer fighter Gregor Trueheart with the red-striped green shield, a couple halflings and a random fighter, and in the far back, my Aunt's thief Ralph Tharn beside my poor old cleric Brother Brussels (as in brussel sprout) with his vegetable coat of arms on his shield. Most of the better-painted figures were done by my mother — including Tharn, unfortunate shemagh and all — whereas the messy and garish monsters in the back are my feeble attempts. Note: I've made a table of all the D&D monsters ported into original Final Fantasy bestiary. It's nearly everything except the bosses, and even some of those! Once again, thanks to moogle_university for inspiring this recap! Nina: "Erupts...from the FIEND' s...?" Final Fantasy I Recap, Episode 7: "Let's do the timewarp again!" Once again, thanks moogle_university to for inspiring this recap! Rei: Hey, guys! Lookit what Bibi gave me -- a list of all the name changes between NES and PSX versions of this game. Momo: Bad...man? MADPONY? Catman? Mancat? 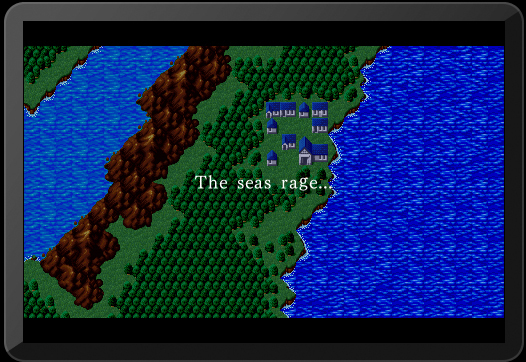 Oh, gosh, the NES translations are so goofy! Final Fantasy I Recap, Episode 6: "Much in the Way That Bricks Don't"
One huge change in Final Fantasy games is that characters became more and more complex, with preset backstories, lines of dialogue and character development within the game. Increasingly, we become observers, puppetmasters, and/or passive participants, discovering what makes characters tick as individuals and coming to know them as fictional characters while (at the same time) seeing their worlds and acting out their adventures in their shoes. Final Fantasy I Playthrough, Episode 5: "Ninja Wizards"
Once again, thanks to moogle_university for inspiring this playthrough/recap! Nina: Spoo looks very heroic, to be sure...but...well... shouldn't there be four Warriors of Light? Momo: Well, see, I thought that if the Prince of Elfheim saw this, then maybe he'd be bowled over by Spoo's bishie awesomeness! Momo: Yep. And let's start calling him "Warrior of Light" in front of the prince. It sounds a lot more noble than "Spoo," don't you think? Nina: That's... very thoughtful, Momo. Final Fantasy I Playthrough, Episode 4: "Of Tea and Airships"
While playing these first few days, I've had many thinky thoughts. So. FINAL FANTASY META. SPOILER FREE. You do not have to have been following my silly playthrough to read these comments. 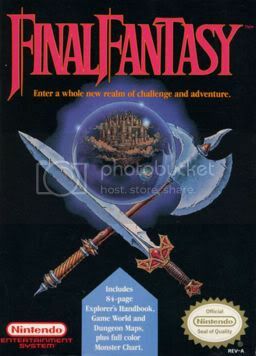 Topic the First: How vintage Dungeons & Dragons shaped Final Fantasy I, and how FF games immediately began to pull away from their D&D roots. Rei: Right. And Spoo's buff and all, so he don't need magic. But I'm a Thief. And a thief's got needs. Nina: Haven't we found enough treasure in the last dungeon crawl to keep you happy? Rei: Well, sure, if you consider weapons we already bought in the last Elfheim garage sale to be worth an hour of slogging through undead crap. But I've got a job to do. Nina: Okay, okay. But this is one of those early Final Fantasy games. We don't start unlocking the good skills until we restore the first Crystal. Rei: Good skills? You mean like 'turn all undead to powder'? Momo: NEVER FEAR! I'LL ROAST THEM WITH THE ALMIGHTY POWER OF FIRA! Nina: Patience, Rei. We've got to be getting close to the first Crystal. We're out of the kiddie pool part of the map. I'm sure you'll acquire a Steal ability soon. Rei: Hope you're right, princess. Final Fantasy I, Episode III: "Well, 6hit." With thanks to moogle_university for inspiring this playthrough. ...with borrowed Breath of Fire III characters adding personality to the generic Four Warriors of Light. Comparison of 1990 FFI on NES (first English edition of Final Fantasy) vs. the 20th Anniversary Edition ported to iOS, which is what I'm playing. Phoenix Downs and Ethers make it MUCH easier than the original, but I am old and Don't Care. moogle_university is starting a ten month replay of Final Fantasy games up through X, at least, with commentary, liveblogging, and gamer geeking. I want to join them. I don't know if I'll have time, but it's too fun an opportunity to miss. Have you ever played this game before? If so, what versions? Nope. Utter tabula rasa. All I know is that there's probably going to be four Warriors of Light, crystals, and a buttload of level grinding and random encounters. What version are you playing this time? FInal Fantasy [I] for iPad. I've already forgotten which remake this is, but I'm guessing it's the Origins 20th annivesary version. Do you have a fannish history with this game? If so, what? Okay! So, time to head to the app store and buy it. Cue the retro gamer nostalgia! EDIT: Click here to read the first session of my FFI playthrough...with silly commentary and screenshots!